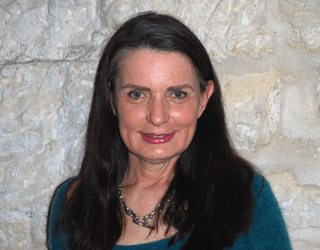 Mistress of the Animals – Did She Make Powerful Medicine with Saffron? Mistress of the Animals from Xeste 3 on Thera. Part Two in a series of articles on aspects of saffron. Photos of wall paintings from the excavated areas of Thera (also called Santorini), are taken from a magnificent site that has expired off the Internet, www.therafoundation.org. Other photos credited where possible. 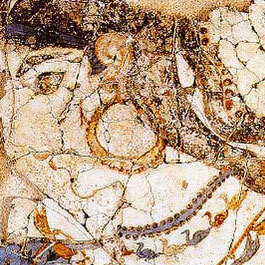 Part One examines the origins of saffron culture in Western Asia, with an overview of the saffron-dominated fresco cycle on Santorini, dating to the 17th century B.C.E. The present article looks at saffron in cultic rituals. It is hard not to look at the goddess on the saffron cushion. Though her state of preservation is less than optimal, she is the focal point of the cycle. 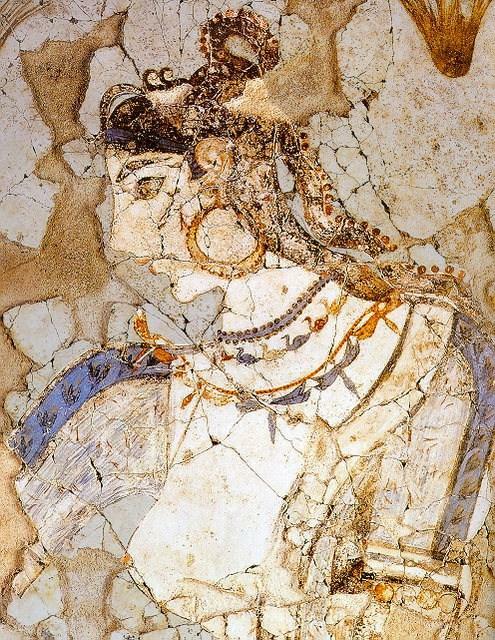 In 1996, the archaeologist Paul Rehak undertook a gendered reading of the Xeste 3 fresco cycle – one that pointed up many subtleties in both the organization of society on Thera and the medicinal use of saffron, by and for women. In his monograph, “Myth, Medicine and Matriarchy: Reconstructing a Female Homosocial Environment in the Thera Frescoes,” he raises as well the issue whether the Xeste 3 frescoes were painted by women, for women – a possibility worth considering. Necklaces with a duck and a dragonfly motif hang in an arc from the throat of the main image. 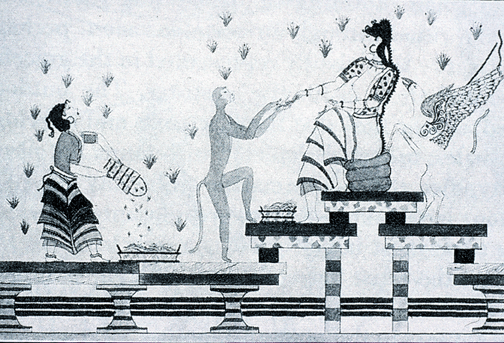 Her blue and white costume is richly embroidered with a saffron crocus motif, the easily recognizable silhouette of the wild-growing C. cartwrightianus that is everywhere represented in Xeste 3 – clinging to rocks, garlanding its gatherers, piled into baskets, and patterning the creamy white field on which all the images are painted. To us, perhaps the most compelling aspect of the goddess is not her regalia, but her expression. Drawing from Nanno Marinatos — Wall of Xeste 3, with Mistress of the Animals. Head turned in profile, her eye is starry with interest, her lips parted as if in speech with the blue monkey to her right offering a handful of saffron. A gryphon flanks her left, present only in paw and wing. She may command girls to gather saffron and bring her tribute, but her companions are animals, on the same platform as herself. We do not know her name on Thera, but she is known to us anyhow. 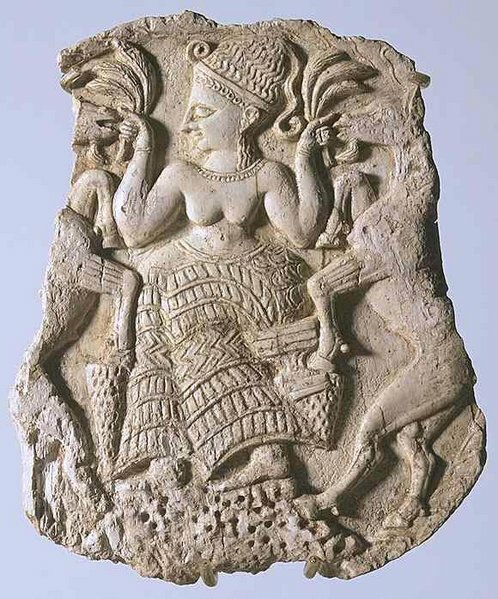 This is the Mistress of the Animals — potnia theron — one of the oldest goddesses of ancient times. And this is not her first or last iteration. As we enter historical times, she often takes the form of Aphrodite.